At the top of the panel, for most tabs, the Configuration dropdown list lets you select a build configuration. When this top field is active, it means that the settings you define in the other fields will be applied to the selected configuration only. For some tabs, the field is inactive; this means that the displayed settings aren't configuration-specific. Build configurations are based on the architecture of the target platform (e.g., x86, ARM) and whether a Debug or Release binary is generated. A Debug configuration lets you see what's going on inside a program as it executes. A Release configuration creates applications with the best performance. This tab lets you customize the tools and tool options used in your build configuration. In the main display area, the left pane shows a list of tools and their option categories. Select a tool from the list to modify its options. The right pane provides the fields for modifying the selected tool. These fields change depending on your selection in the left pane. This tab lets you customize the selected build configuration by setting user-defined build command steps and by defining a descriptive messages to show in the build output. To ensure reasonable custom build behavior, sensible input must be given when specifying custom build step information. Custom build steps are not verified for correctness and are passed exactly as entered into the build stream. In the field descriptions given below, the term main build is defined as the sequence of commands to execute when a build is invoked not including pre-build or post-build steps. Identifies any steps that must occur before the build takes place. Note that the pre-build step is not executed if the main build is up to date, only when it isn't. Any attempt to execute the main build will occur regardless of the success or failure of the pre-build commands. Command — Specifies one or more commands to execute immediately before the execution of the build. Use semicolons to separate multiple commands. 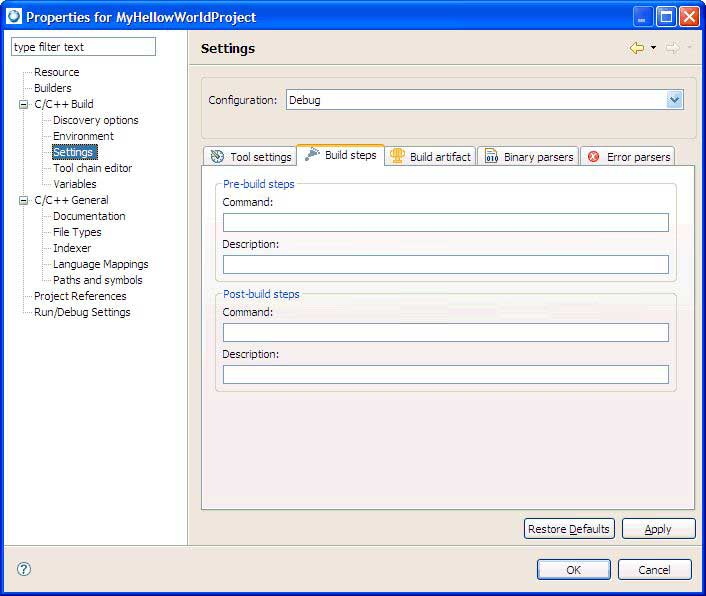 Description — Specifies optional descriptive text associated with the pre-build step that is shown in the build output immediately before the execution of the pre-build commands. Identifies any steps that must occur after the build takes place. Note that the post-build step is not executed if the main build is determined to be up to date. It will be executed only if the main build has executed successfully. Command — Specifies one or more commands to execute immediately after the execution of the build. Use semicolons to separate multiple commands. Description — Specifies optional descriptive text associated with the post-build step that is shown in the build output immediately after the execution of the post-build commands. 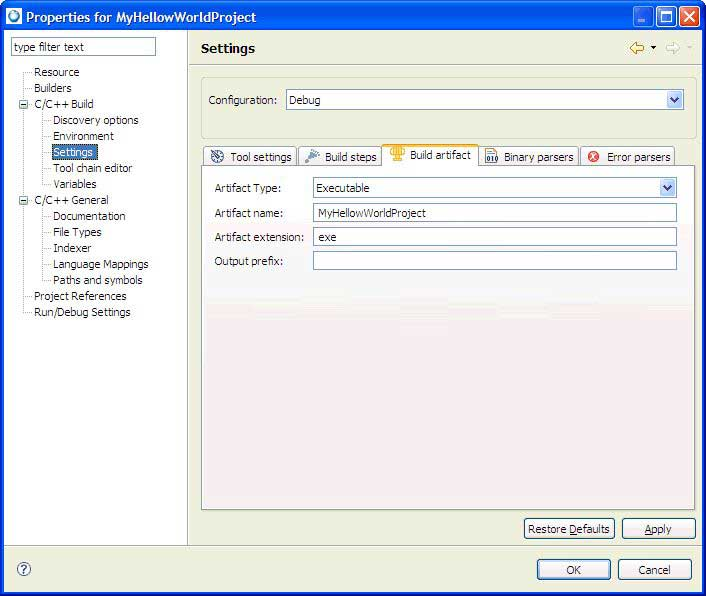 This tab lets you specify build artifact information, such as the type and name, for the selected build configuration. Specifies the type for the selected artifact. This determines what's built for the current configuration, such as an executable, static library, or shared library. Indicates the name of artifact. By default, this name is the same as project name. Specifies the file extension for the specified artifact type. Indicates a prefix that you want to prepend to the output results. 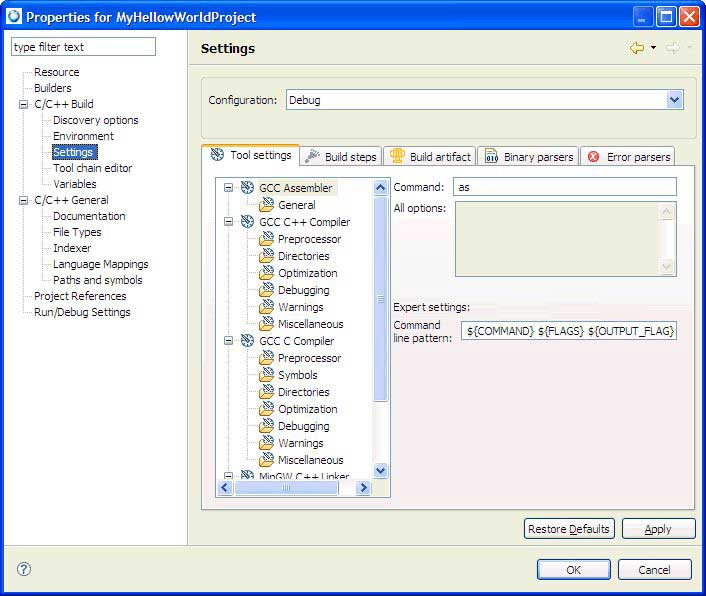 In this tab, you can select the binary parsers required for a project to ensure the accuracy of the Project Explorer view and to successfully run and debug your programs. After you select the correct parser and build your project, you can view the symbols of the object file using that view. If you're building a C/C++ project, this tab lets you define which binary parser (e.g., ELF Parser) to use to deal with the project's binary objects. Lists all of the binary parsers currently known to the CDT. Select the parsers that you want to use by checking their boxes. You can click the corresponding line to edit parser's options in the bottom pane, if required. 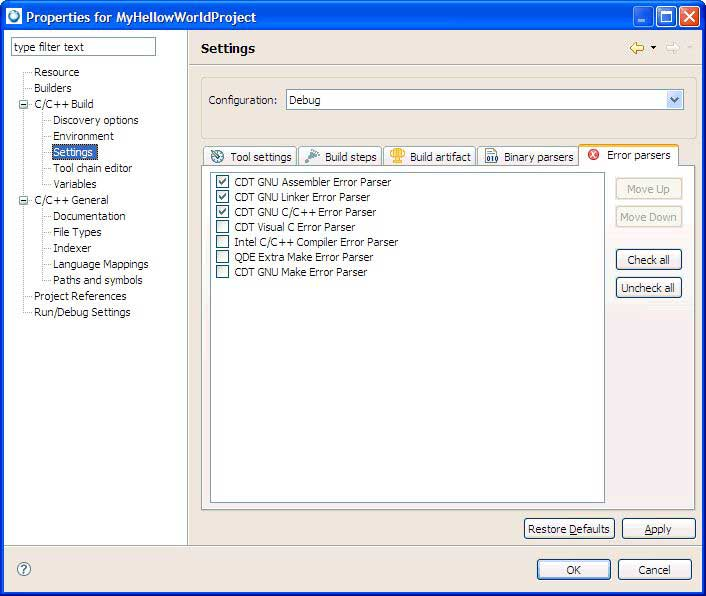 Shows the options for the parser currently selected in the list above. 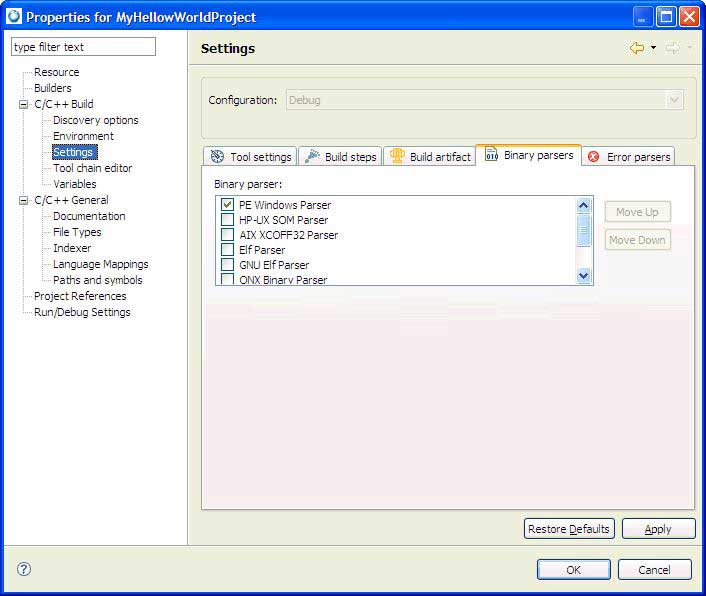 The exact options shown depend on which parser you select; in particular, some parsers have no options at all and hence, this pane isn't shown. Moves the selected parser higher in list. Note that the order matters for selected parsers only: they are applied to binaries in the same sequence as defined by the user. The order is not preserved for unchecked parsers, so you do not have to move them. Move the selected parser lower in list. Note that the order matters for selected parsers only: they are applied to binaries in the same sequence as defined by the user. The order is not preserved for unchecked parsers, so you do not have to move them. Use this tab to customize the list of filters that detect error patterns in the build output log. Moves the selected parser higher in list. Note that the order matters for selected parsers only: they are applied to error logs in the same sequence as defined by the user. The order is not preserved for unchecked parsers, so you do not have to move them. Move the selected parser lower in list. Note that the order matters for selected parsers only: they are applied to error logs in the same sequence as defined by the user. The order is not preserved for unchecked parsers, so you do not have to move them. Selects all error parsers in the list. Makes all error parsers in the list unselected.